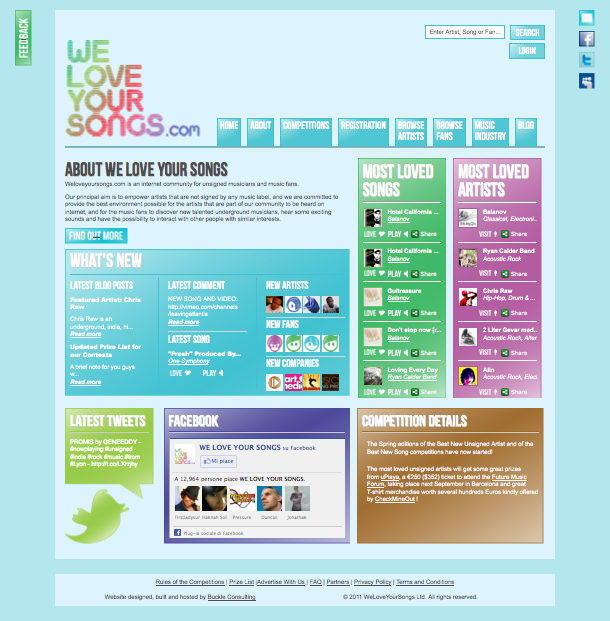 Weloveyoursongs.com is an internet community for unsigned musicians and music fans. Our principal aim is to empower artists that are not signed by any music label, and we are committed to provide the best environment possible for the artists that are part of our community to be heard on internet, and for the music fans to discover new talented underground musicians, hear some exciting sounds and have the possibility to interact with other people with similar interests. On Weloveyoursongs.com you will always be able to take part to new challenging free to join contests where you can increase your popularity, get voted and if you are good enough be awarded with some great prizes! The WeLoveYourSongs team is composed by a network of inspired collaborators located all over the world, with a strong passion in common for music and innovation. We really value the members of our community and we would love to receive a lot of your feedback in order to evolve and make Weloveyoursongs.com an even better place where is possible the exchange of constructive criticism between us, unsigned musicians and their fans. Creates a real community where unsigned artists can have their music heard by tons of music fans and professionals eager to discover new sounds. We aim to exploit the power of social networks to empower emerging artists by giving them a real help to obtain a global exposure.